(Central Islip, N.Y., Feb. 27, 2018) – The Long Island Ducks today announced the signing of right-handed pitcher Rob Rogers. He will begin his second season with the Ducks and sixth in professional baseball. 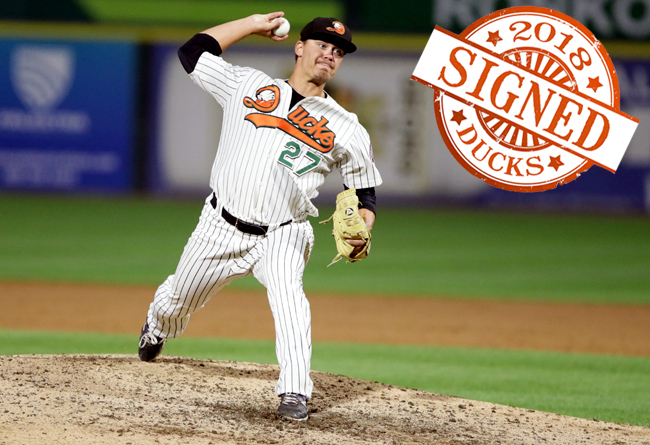 Rogers appeared in a career-high 58 games with the Ducks in 2017, good for second among Ducks pitchers (Patrick Crider, 63) and ninth in the Atlantic League. He equaled his career-high in wins, posting a 6-1 record to go along with a 3.93 ERA, two saves and 40 strikeouts in 66 and one-third innings of work. The Islip resident allowed just three runs over his first 14 outings of the season (1.53 ERA) and just one run over his final 10 regular season games (1.13 ERA). He then went on to make five scoreless appearances in the postseason, striking out four batters in three and one-third innings. The 27-year-old spent five seasons in the Los Angeles Dodgers organization to begin his professional career, reaching as high as Triple-A in 2016. In 145 games (four starts), he totaled a 3.84 ERA, 18 saves and 204 strikeouts to just 79 walks over 220 and one-third innings. The Keystone College alum accrued career-highs in innings pitched (79.2) and strikeouts (75), won six games and posted a 3.28 ERA in 2015 when he split time with Advanced-A Rancho Cucamonga and Double-A Tulsa. Rogers was originally drafted by the Dodgers in the 32nd round of the 2013 amateur draft.